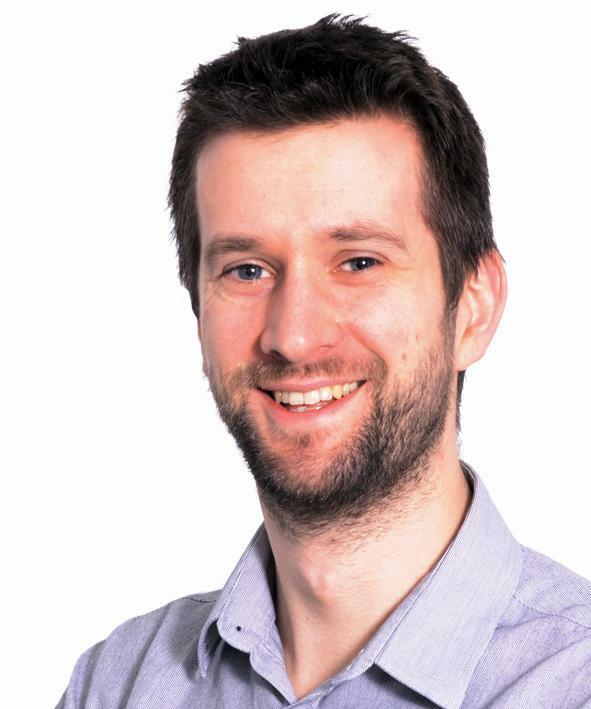 At the 2015 CQG Editorial Board meeting in London, it was agreed that a subset of the gravitational physics community should be surveyed to find out if there was interest in launching a Letters section for CQG. In this survey, a number of gravitational physicists were asked to answer a set of questions about Letters. Just to make things interesting, invitees were split into 2 groups: one group was asked to think as authors and the other as readers. What features do CQG’s authors and readers look for in Letters? Click the image to see the data. 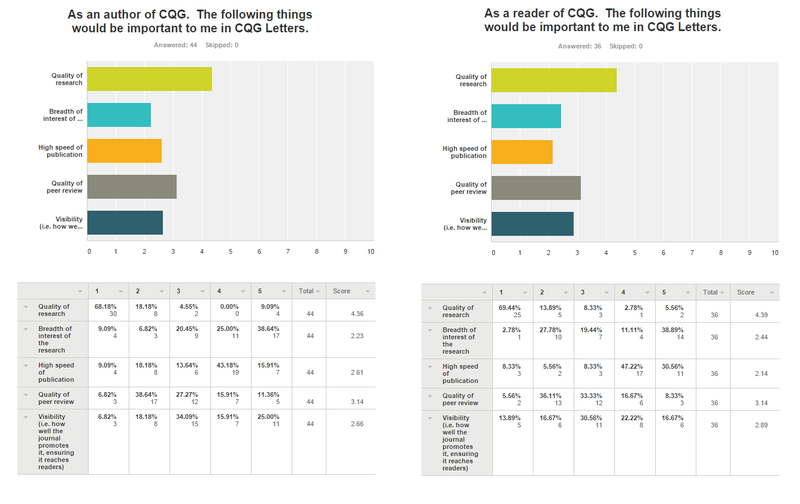 CQG’s audience show a clear preference for quality of research and quality of peer review. Luckily CQG has a dedicated in-house team of peer-review specialists eager to take on new challenges. Developing a fast, high quality peer-review system for CQG Letters is a welcome proposition for that team. If the journal does choose to launch a Letters section, quality will be the primary focus of that section. No doubt, the CQG Editorial Board and Advisory Panel will be closely involved with adjudicating over those standards. It’s worth noting that ‘breadth of interest’ is a comparatively undesirable feature among CQG’s audience. (Surprising when you consider that this is often seen as a distinguishing feature of Letters.) As a specialists’ journal, much of CQG’s content is narrow in interest. It seems that the preference here is for CQG Letters that are ‘highly interesting’ rather than ‘broadly interesting’. Which promotions are most highly valued by CQG’s audience? We believe that, as the volume of research continues to grow rapidly, the ability of journals to put the right content in front of the right audience is becoming increasingly important. CQG works to maximise the visibility of authors and their work and also showcases the best papers, making them easy for readers to find. The survey showed that the long-running CQG Highlights promotion holds a strong reputation. CQG+, a new service launched comparatively recently, already ranks above promotion via Twitter and Facebook. What length should CQG Letters be? Is there an optimal length for a CQG Letter? It certainly seems that way going by the survey results. Authors and readers alike, showed a clear preference for a flexible 6 page length limit. 4 – Should CQG launch a Letters section? 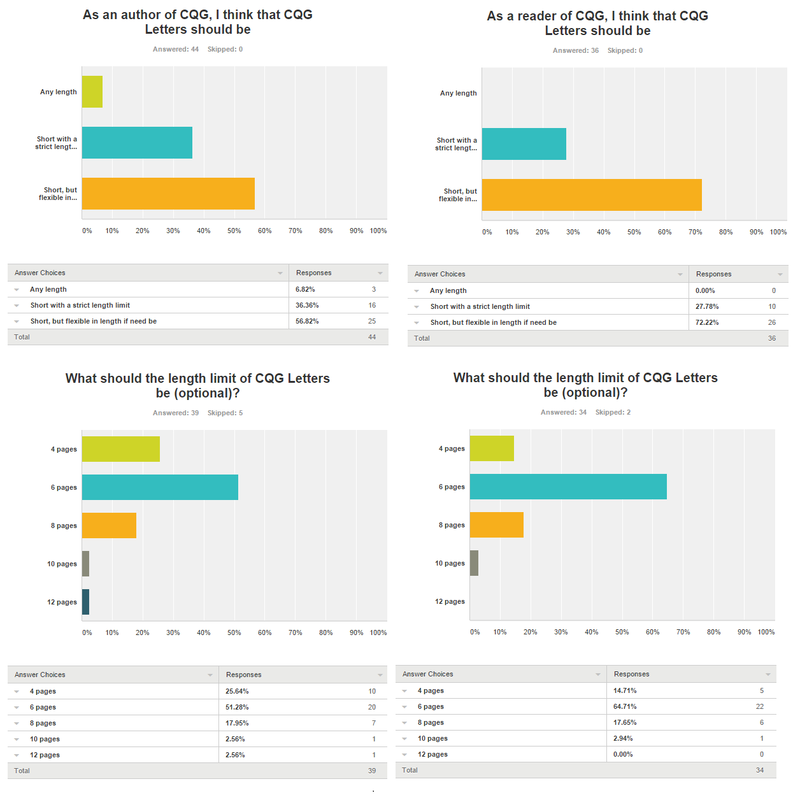 There is clearly overwhelming support for a Letters section in CQG. Authors agree, almost unanimously, that they would publish Letters in CQG and readers voted strongly in support of this article type being introduced. 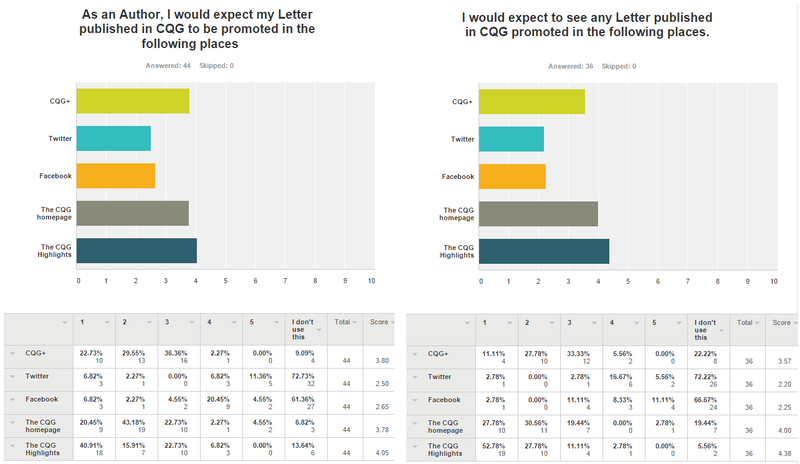 We received a number of comments at the end of the survey giving more nuanced feedback about how CQG could add value to Letters, differentiate itself from competition and maximise visibility. I’d like to thank all of the survey respondents for taking the time to give this feedback. It has all been taken on board. It’s evident to us that we have an opportunity to launch something that serves the needs of the gravitational physics community. The next steps seem very clear. This entry was posted in News and tagged Letters by Adam Day. Bookmark the permalink.